Asus today announced what it calls Project Avalon, a gaming PC designed with ease of upgradeability in mind and genuinely sharp looks. But according to the company, Project Avalon goes beyond just appearances. In fact, the entire innards of the system have been completely rethought. Instead of using any of the existing motherboard form factors, Asus has developed a modular board system that allows users to swap out actual components of the motherboard. Say you want more PCIe slots. Sure; just pop out the expansion daughterboard and swap in another. Need more IO ports in the rear? Pop out the module for another. Asus developed Project Avalon in conjunction with InWin, which has been making some stellar case designs lately. The power supply is also uniquely designed. There are no modular cable ports, just a simple single interface that connects to a slot on the motherboard. Swapping is made easy, and because of this, there are no cables running through the system at all. Cable management not required. Drives are also modular, with a rail/slot system similar to what you see on rack-mount servers. Right now, Project Avalon is based on the X99 platform, so only socket 2011-3 CPUs are supported. This means it'll accept Haswell-E and the new Broadwell-E CPUs. Asus did not mention if other chipsets will be supported, but we're certain those will be available if Project Avalon takes off. Potential drawbacks of the system include being at the mercy of whatever motherboard modules Asus decides to make available. You can't stick in a common mini-ITX or regular ATX board. 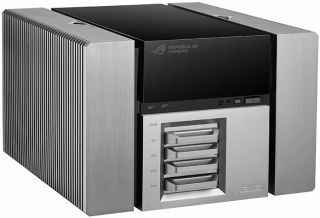 Compatibility with aftermarket coolers is still up in the air, but Asus said that with proper mounting add-ons, many existing models should work. Right now, it seems Project Avalon also only supports a single graphics card, but there's room on the opposite side of the case, but it looks like it's only available for a liquid cooling radiator. Caveats aside, Project Avalon is an interesting concept that I hope Asus makes a genuine effort bringing to market. We've seen modular PC projects before, but the concept has never had a breakout hit.